The NCAA Tournament lacked for drama Thursday when 13 of the 16 higher-seeded teams won. Most teams that were expected to win wound up doing exactly that. Even the biggest seed upset -- No. 12 seed Murray State over No. 5 seed Marquette -- was the trendiest upset pick of the day. In other words: Thursday was mostly chalk. It's only right that Friday presented a March Madness-sized course correction of epic proportions. How about No. 13 UC Irvine over Kansas State, followed by No. 12 Oregon over No. 5 Wisconsin, followed by No. 12 Liberty over No. 5 Mississippi State? Call it upset Friday as the first round of the NCAA Tournament drew to a close. Combined with No. 1 seed Virginia nearly losing to a No. 16 seed for a second consecutive year, No. 2 seed Tennessee falling behind in the second half to No. 15 seed Colgate before a revival, Duke playfully toying with a tense game for a short bit, Friday's been an upgrade vs. Thursday. Here are the quick-hit, big-picture takeaways from Friday's action. Well, at least North Dakota State made it interesting for a half. Then the second session started and No. 1 seed Duke deployed Zion Williamson to stronger capacity and, well, yeah, the game effectively ended in a hurry. The final score: 85-62. NDSU with the cover, though. You want to see Zion. We know. The Player of the Year front-runner finished with 25 points on 12-of-16 shooting and grabbed three rebounds. Williamson broke the game open, but RJ Barrett had the best line. Arguably the second most talented player in America finished with 26 points and 14 rebounds. Hey, we got a close Duke game early and then the fun stuff. For those who were rooting for North Dakota State to do the unthinkable, you have to admit that keeping Duke around until at least next weekend is what's best for the tournament and interest therein. The best conference in college basketball has backed up its reputation through the early part of this tournament by going 7-1. No. 11 seed Ohio State wasn;t supposed to beat No. 6 seed Iowa State late Friday, but you could say the same of No. 10 seed Minnesota and No. 10 seed Iowa and, for some, No. 6 seed Maryland vs. Belmont and we all know what happened. The Big Ten is aching for a national championship; the conference last had one when Michigan State won the whole thing in 2000. But so far, the league is looking impressive. With seven teams now safely in the second round, there's a chance that the Big Ten could occupy 25 percent of the Sweet 16. Of course, we're guaranteed to lose at least one team from the conference in the second round: No. 2 Michigan State plays No. 10 Minnesota on Saturday. For the seventh straight season, Cincinnati and its coach failed to make it out of the first weekend of the tournament. No. 7 seed Cincy fell 79-72 against No. 10 seed Iowa. This is now a real thing for Mick Cronin, who has not shied from the fact that Cincy, which is one of only six schools to make the past nine NCAA Tournaments, is not respected nationally because of its lack of March success. The Bearcats had not lost a game it led at halftime since the NCAA Tournament last season, when it blew a 22-point lead vs. Nevada. And on Friday, Cincinnati led by as many as 13 in this one, albeit early in the first half. But still, what a stinger: to only lose games with halftime leads in the NCAA Tournament? Cronin has built a very strong program, but might he need a fresh start eventually? His record in the NCAAs in 6-11. It's a reliable team until about March 20 each season. By the way, No. 10 seeds went 3-1 vs. No. 7 seeds. Only Wofford held up its end of the bargain. SoCon, stand up. The Sooners wrecked Ole Miss 95-72 and we are now at the point where no one outside of the state of Mississippi will likely remember this team even being in the field. The ninth-seeded Sooners provided the fourth largest margin of victory for a No. 9 seed over a No. 8 seed. It was a fairly shocking outcome for an OU team that was coming off a Big 12 tourney loss to West Virginia, but overall compared favorably to last season's squad with Trae Young that lost to Rhode Island in the first round. Now the Sooners get Virginia in the second round, which wobbled early, but then found its 1-seed form vs. Gardner-Webb. Not a single fan inside a packed-out BOK Center in Tulsa on Friday night could be seen sitting in their seat. The show, the finish and the finale Iowa State vs. Ohio State provided delivered too much suspense for sitting before Ohio State eventually pulled away, 62-59, in one of the most flashy finishes of the day. Couple points here or there, and Iowa State's playing for the Sweet 16, evidence of just how fickle the NCAA Tournament can be. But the bottom line is that the Cyclones' talent was far superior, their ceiling much higher, and yet they just fell flat in a first round exit. For an ISU team that was both great and perplexing at times this season, a fitting way to a season's end. Iowa State has repeatedly influenced many brackets by winning three Big 12 tournaments in the last five seasons, and in those three seasons the Cyclones have won one NCAA tournament game. Texas Tech's super sophomore made himself some money on Friday. Well, not literally; he's still a student -- and an amateur at that. But come this summer, when NBA teams are trying to examine prospects it might draft into its organization, Jarrett Culver's sure to be among the 10 or so stars that stand out and cash in on being drafted high in part because of what he did in the first round of the tournament. Culver scored 29 points in pacing No. 3 seed Texas Tech to a 72-57 win over Northern Kentucky, and he was brilliant throughout. The defense. The shot-making. He showed flash -- plenty of it. But there's a tranquility to his game, a calm, that stuns you when you check his stat line. The Paul George of college basketball. You blink once, and suddenly he's up to 20 points, all while deflecting balls left and right and impacting the game in every single facet. Charlottesville-sized crisis averted: No. 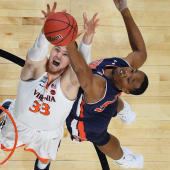 1 seed Virginia escaped complete and utter disaster by overcoming a six point halftime deficit to defeat No. 16 seed Gardner-Webb 71-56. And make no mistake, this would have been a crisis. Had the Cavaliers folded, it would have made the second consecutive season Virginia lost in the first round as a No. 1 seed. Virginia won, so again: crisis averted. But to be forced to mount a comeback to defeat a 16 seed on opening day is less than ideal for a team that entered the postseason with a question mark surrounding it based off last season's outcome. When you have to escape an upset against that caliber of a team, it's not exactly a harbinger of future successes. And boy, did the No. 13 seed Anteaters from UC Irvine eat! In defeating No. 4 seed Kansas State 70-64 Friday, it laid claim to the largest seed upset of the tourney -- and a 17th consecutive win dating all the way back to mid-January. Oregon's 72-54 win over Wisconsin marked the end of the college career of Wisconsin's Ethan Happ, who deserves a few words here. Happ leaves UW as, unequivocally, one of the five best players in school history. If you wanted to make an argument for him in the top two, it's viable. Happ hangs up his reds and whites as one of only six men's Division I players in history to score at least 2,000 points, grab 1,000 rebounds and dish 400-plus assists. He was unique. A true big man, Happ attempted only 16 3-pointers in his four seasons with Wisconsin. He almost never took a shot outside the paint. But he was a great passer, a true valve to run an offense through. This season, he finished No. 1 in Ken Pomeroy's Player of the Year algorithm -- yes, ahead of Zion Williamson -- which measures how efficient a player is. In truth, you could dedicate 3,000 words to Happ's character, importance and distinctiveness to Wisconsin's program. The NCAA Tournament has a lot of glory but also a lot of this: great seniors who get unceremoniously knocked out. Wisconsin's loss to Oregon is forgettable, but Happ's career is indelible. The team will be hard-pressed to be better next year without him. Wisconsin was 87-52 in Happ's four seasons. After an early-game nap that opened the door for No. 16 seed Iona to grab the lead over No. 1 seed North Carolina -- the second ACC No. 1 seed to take a deficit into half on the day -- the Tar Heels recovered as only they can, exploding for 51 second half points. It was a clinic in ball movement and beautiful offense down the stretch, led by Cam Johnson's 21 points and Nassir Little's 19. By the final 88-73 score, you'd never have guessed UNC labored through it more so than a 1 seed should early. After the No. 2 seed Tennessee Volunteers jumped to a comfortable 12-point lead at half, Colgate, whose best player scored zero points (!! ), made a superhuman run in the second half, even going as far as taking the lead with less than 12 minutes left. Things got uncomfortable in Vol-town. But the Vols and their veteran-laden roster eventually woke up. Credit to UT for not completely falling asleep at the wheel here to take a 77-70 first-round win. It advances to face No. 10 seed Iowa after No. 7 seed Cincinnati bowed out early, another win within the day that could bode well for its chances of surviving the South Regional. The "conference of champions" was a beleaguered mess this season, but a mini-surge is occurring right before our eyes. After sneaking Oregon into the backdoor of the tournament to join league-winning Washington and runner-up Arizona State, a three-team Pac-12 triumvirate in the Dance, the second round will feature two of the three. No. 11 seed Arizona State did no favors to the optics of the league's strength, losing by 17 to mighty Buffalo, but Oregon ousting No. 5 seed Wisconsin and Washington knocking out No. 9 seed Utah State are undeniable wins for the league. Saint Louis scored 18 points (yes, 18 -- not a typo!) in its first half outing against No. 4 seed Virginia Tech, the lowest scoring output by a team in the first round that was not a No. 15 or No. 16 seed all weekend. The Billikens still managed to score a respectable 52, a number NC State in early February would have taken in a heartbeat, but it was nowhere close to good enough to win as No. 4 seed Virginia Tech strutted to a 66-52 win. Yes, quite literally, as all four No. 1 seeds got out with a first-round win this year. And you know what? That's good. If we get a No. 16 seed winning frequently going forward it's going to bring much-wanted chaos to the bracket, but the specialness could lose some of its flavor. How about this: we get one No. 16-over-a-No. 1 each decade. Rare enough to be truly shocking, frequent enough to give a jolt to these annual proceedings. No. 1s are now 139-1 all time vs. No. 16s. The average margin of victory for No. 1s this year was 22.8; Gonzaga was the only No. 1 seed to cover the spread. It was a real scare when Virginia was down 14 to Gardner-Webb. It was bizarre when the worst Iona team in years was nonetheless doing its thing vs. UNC for a half. And North Dakota State kept us occupied for 20 minutes vs. Duke. But the No. 1s went on to do what they should have done, and things feel back to normal. This was the worst season for the conference in more than a decade. It managed to get two teams in thanks to VCU bombing out in the league quarterfinals, but neither team showed well on Friday. Tournament champ ion Saint Louis was treated as an annoyance by No. 4 Virginia Tech in the East Regional, while No. 8 VCU was outdone by No. 9 UCF, which gets the honor of going up against No. 1 Duke. The Atlantic 10 needs to bounce back next season if it doesn't want to lose the pace of those other leagues, like the Mountain West, WCC and even the MAC. Important year ahead. There are seven double-digit seeds playing in the second round. San Jose's site on Friday is responsible for three of them. Credit to No. 4 Virginia Tech for getting things done vs. Saint Louis, but prior to that it was all lower-seeded teams that left as victors. No. 13 UC Irvine knocked off No. 4 Kansas State, No. 12 Oregon bowled over No. 5 Wisconsin, No. 12 Liberty got over on No. 5 Mississippi State. Had Saint Louis been able to overcome the Hokies, San Jose 2019 would have matched Tampa 2008 as the only sites to ever have four lower-seeded teams all win in the first round. Still, for a first round that was good-not-great, San Jose was pretty enjoyable. That UC Irvine-Oregon matchup on Sunday -- the final tip of the second round -- could be terrific. No. 3 seed Houston isn't just advancing, it is prancing into the second round after destroying Georgia State 84-55 in Tulsa, Oklahoma, on Friday. Kelvin Sampson's revival of the Cougars program is every bit as real as it seems: They are one win away from the Sweet 16, they're back in the tournament for a second consecutive season, and Sampson is among a handful of viable Coach of the Year candidates.